Fifth Avenue South dates back over half a century to its origins as a narrow, makeshift runway for tourists like Charles "Lucky" Lindbergh, who landed his plane here in 1932 to pick up supplies. Gulf fishing and a small golf course at the beach end of Fifth Avenue attracted a few more visitors. Shells covered the sidewalks of Fifth Avenue where you now see paving, and only a scattering of businesses straddled US 41 back then. By 1930, this junction known as Four Corners comprised a garage, gas station, train depot, the Chamber of Commerce, telephone company, and a couple of stores. Club 41 entertained such celebrities as Gary Cooper and Gertrude Lawrence. Traffic to the area increased upon the completion in 1928 of Tamiami Trail East, a highway hewn through swampland from Naples to Miami. The foresight and resources of Barron Collier made this shortcut possible. Before, if you wanted to get to Miami, you had to travel up to Jacksonville via Tamiami Trail North (built 1918) and then south again! 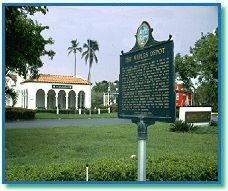 Naples began a train service in 1927, and the Orange Blossom Express arrived daily at the Naples Depot. The service was discontinued in 1971, but the whistle still blows at noon every day. The train station has been restored, and you can climb aboard the 1947 Club Car, 1909 Caboose and 1920 Baggage Car, now converted into a gift shop. The Naples Depot is also home to the United Arts Council of Collier County. Businesses of historical note on Fifth Avenue include the Naples Women's Club, Situated on Park Street, off Fifth Avenue, which provided the town with its first library in 1932. The first bank opened on Fifth Avenue in 1949.